Making environmentally conscious consumer choices can be difficult when walking down supermarket aisles awash with hyper-marketed products. Enter GoodGuide, who has just released a new barcode scanning iPhone application that gives shoppers the power to seek out socially conscious products, right in the palm of their hand. 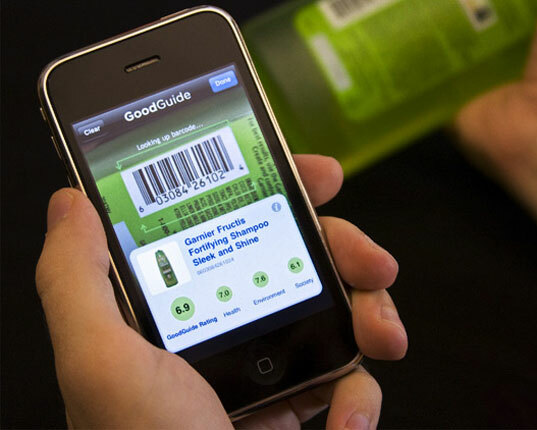 Just like the GoodGuide website, the new barcode scanner application draws from a wealth of independent, scientific information on the health, social and environmental performance of more than 50,000 consumer items and companies to provide instant product ratings to shoppers. GoodGuide licensed Occipital’s state-of-the-art RedLaser barcode scanning technology for its new application. Simply by scanning the barcode with an iPhone, consumers can find out the nitty-gritty details of their favorite personal care, household chemical, toy and food products. Wondering whether that household cleaner you’re eyeing is toxic? Just scan it! Shoppers even help pick the products to be rated next based on which ones they scan most frequently. Best of all, GoodGuide’s newest application is available for free from Apple’s iTunes App Store. What an ingenious idea to put this application on the iPhone. They should definitely have this available for other phones too. Drejto made some really good points and we couldn’t agree with you more. We are on the socially conscious and environmental friendly bandwagon too. We make some cool hoodies and t-shirts that are organic and sweat-shop-free. They are made out of cotton using non-reactive dyes and water-based inks. We are a movement that is committed to using materials in a way that promotes our ecological system. Check us out @ www.thehotlovemovement.com. i think it´s a great idea, they also should do for another cellular phones!!! like black berry!! This is great. It creates the sort of corporate transparency that could slowly transform the industries with the most negative environmental and health impacts. I just hope that work is done to make people aware that their consumer choices don't just meet their needs and desires, but can also have huge impacts on the health of their families, the economy and our world. Goodguide will definitely make social/environmental/health-conscious shopping easier for those us who already care about the hidden externalities of our actions, but will it make others care? I sure hope so.